Psalm 150 brings the entire Psalter to a resounding and worshipful climax. Some variation of the phrase “praise the LORD” recurs 13 times in this short hymn. God’s missional people join together with all living beings to form a choir to praise the LORD! Ps 150 provides God’s people with the who?, where?, why?, how?, and by whom? of praise. Praise is directed to the LORD. Just as all of Psalms 146–150, Psalm 150 begins and ends with the exhortation “Praise the LORD.” The repetition is a reminder of the object of our praise and subject of our lives. The LORD is our God and we live for his praise and adoration. It is vital for us as we seek to follow Jesus and serve in his mission to stay in the worship of the LORD. Verse 1b calls for praise throughout creation. Praise is not limited to any sanctuary whether it be the heavenly sanctuary or the temple in Jerusalem of old or even in our worship centers of today. Rather praise is appropriate across the vast expanse of God’s creation. Verse 2 focuses on the “why” of praise. The psalm calls God’s people to worship because of what God has done and who God is. “Acts of power” refer to the mighty deeds of salvation that the LORD has done. For God’s Old Testament people, this included praising God for his work of creation, for the Exodus from Egypt, for the giving of the Law, and for faithfully sustaining Israel. These acts of salvation testify to God’s greatness. As followers of Jesus, we can add to God’s might works the life, death, and resurrection of Jesus our savior as well as for the outpouring of the Holy Spirit. Verses 3–5 stand at the heart of Psalm 150 and give us the most comprehensive list of musical instruments in the Psalter. It provides the “how” or “means” of worship. The portrait of worship implied here is a praising of the LORD that is vigorous and loud. It is also one that deploys a full orchestra of sounds to add beauty, harmony, and symphonic texture to the voices of worshipers. This psalm calls for worshiping God for his victory. As we saw in Ps 149: , the use of “timbrel” and “dancing” (4a) often accompanied community celebrations of great military victories (e.g., Exod 15:20 and 1 Sam 18:7). Thus, worship in the present is done in anticipating of singing refrains of God’s final victory. Verse 6 brings Ps 150 and the entire Psalter to a final climax by issuing an invitation. It is an audacious one. The psalmist calls all creatures to praise the LORD. This points to the goal of history. The end of mission is praise. What does this psalm teach us about worship? How would you live your life differently if you knew that history ends in all creation praising the LORD for his victory? Psalm 149 moves the general call for all creational praise in Ps 148 to focus on the specific role played by God’s people within the mission of God. Psalm 149 is a bold and daring psalm of praise that exhorts God’s people to announce God’s ultimate victory and live in light of it in the present. Psalm 149 begins and ends with “Praise the LORD.” Psalm 149 provides the rationale for worship by focusing on God’s victory and on God’s people’s role in proclaiming it to the nations. Verse 1b invites God’s people to sing a “new song.” This language is typical of the Old Testament worship of God for a new work of God’s salvation (Isa 42:10; Pss 96:1, 98:1, 144:9). “New” reminds God’s people that God’s victories and acts are not merely past tense. There is an abundant future and God continues to move in the present to create it. Verse 2 links this new song to the worship of God as the maker of God’s people as well as their true king. Verse 3 is critical for understanding the meaning of Ps 149. It envisions God’s people praising God with dancing and playing of timbrel and harps. The language here is important. A review of contexts where God’s people deploy dancing and timbrels together in worship all involve God’s people celebrating a military victory over enemies (Exod 15:20–21, Judges 11:34, 1 Sam 18:6-7 cf. Ps 150:4). Significantly in these contexts, the worshippers played no role in the actual battle. They either celebrated the return of the warriors from battle or praised God for his sole role in securing an abundant future for God’s people. This is important because Psalm 149 contains imagery that may be misread as exhortations to violence. Verses 2–4 assume God’s kingdom has been fully established by God alone without the aid of any human power or weaponry. As verse 4 reminds us, God “crowns the humble with victory” rather than calling God’s people to fight literally against the nations to achieve victory. What role then do God’s people serve in God’s mission? It is simple and audacious. God’s people function as witnesses who testify to the nations of God’s victory and greatness. They are to epitomize joy and gratitude to the LORD (v. 5). Psalm 2 opened the Psalter by declaring the security of the future for God’s people through the reign of God as represented by the LORD’s Messiah. The nations were invited to find happiness and security along with God’s people by aligning with God’s purposes. Psalm 149:6–9 assume God’s victory over the nations. These verses contain violent imagery of battle but this language is metaphorical. God’s people win battles not with weapons fashioned by human hands but by embodying faith, love, and hope (Ephesians 6:10–17). God’s people testify to God’s good future through praise and worship. This is the privilege and glory of all who align with the LORD (149:9). This prayer of praise is a crucial reminder to God’s people in whatever era we find ourselves of our mission to witness to God’s good, greatness, and final victory. We do this not with displays of human power or the flashing of weaponry, but with our voices singing out the good news of God. How does this psalm teach us to pray? What is the mission of God’s people? How does this psalm envision God’s people responding to the nations that may rage against God and God’s mission? The medieval monk St. Francis of Assisi (early 13th century) penned a hymn beginning with these words “All creatures of our God and King, Lift up your voice and with us sing.” Assisi was drawing on Ps 148 for inspiration; his opening lines capture aptly the theme of the psalm. Ps 148 envisions a vast choir that includes singers from all parts of creation joining in the worship of the LORD. The exhortation “Praise the LORD” again brackets the psalm and serves to link Ps 148 with the other praise hymns of 146–150. Ps 148 breaks neatly into two parts: vv. 1-6 and 7–14. In verses 1–6, the psalmist exhorts the heavens to praise the LORD; in verses 7-14, the psalmist speaks to the inhabitants of the earth. The assumption here is that the LORD stands outside each of these realms. As Creator, the LORD sits enthroned above the highest heavens and can look down upon all of his creation (113:4). Ps 148 imagines the heaven and earth praising the LORD. Verse 1b offers a general exhortation to praise the LORD from the heavens. Verses 2–6 presents the specific of those invited. The psalmist calls out first to the angels and the inhabitants of heaven. They are to lift their voices to the king. Verses 3–4 then turn to the heavenly objects. Ps 148 calls out to the sun, moon, stars, and rest of the universe to join in praise. This is a reminder that, no matter how vast and spectacular our universe is, it is part of God’s creation and owes its existence and praise to God alone. Moreover, this is an implicit warning not to worship the creation no matter how beautiful and awe-inspiring it may be. Verses 5–6 emphasize God’s power and sovereignty over all creation. Verse 7 shifts the perspective by calling on the earth and seas to praise the LORD. Verses 7–13 exhort all of the various inhabitants of the sea and earth to worship God. This section invites us to imagine all of God’s creatures to join the chorus of the heavens. This includes the sounds of wild animals, the singing of birds, and even the music of fish of the sea. Most of us have experienced the beautiful sights and sounds of the natural world. God’s declared his creation to be “very good” (Gen 1:31). This psalm describes an all creational celebration of the LORD. Our psalm ends with a reminder in verse 14 of the special relationship that the LORD enjoys with God’s people. God’s people must worship too, but they worship in the understanding of their role and place within God’s mission. This role will be explored in detail in Ps 149. How does this psalm imagine worship? What is the significance of the psalmist inviting all creation to praise the LORD? If you are familiar at all with the book of Psalms, you’ve likely heard of the association of the Psalter with King David. David was a musician before he was king. The stories about David in the books of Samuel record him playing music for king Saul (1 Sam 16:14–23) and singing songs at key points in the narrative (e.g., 2 Sam 1:17–27). Just as Moses is associated with the five books of the Law (Genesis–Deuteronomy), David is linked with the five books of the Psalms. About half of the books 150 psalm carry the title “Of David.” This phrase does not necessarily imply authorship in the original Hebrew. There are undoubtedly psalms in the book composed by David, but the various titles to the psalms (whether “of David” “Of Moses” “Of Korah among others) may also be dedications. Regardless, the constant refrain “Of David” through the psalter gives the book a Davidic feel and functions to serve key theological and interpretive functions. First, David models the life of prayer by showing that even a great leader must live out of dependence not on human power but on God. Second, the references to David serve to link the prayers and praise of the Psalter with real life events. The implication is that the Psalms are prayers forged in actual life settings so that we can confidently use them in our daily lives. 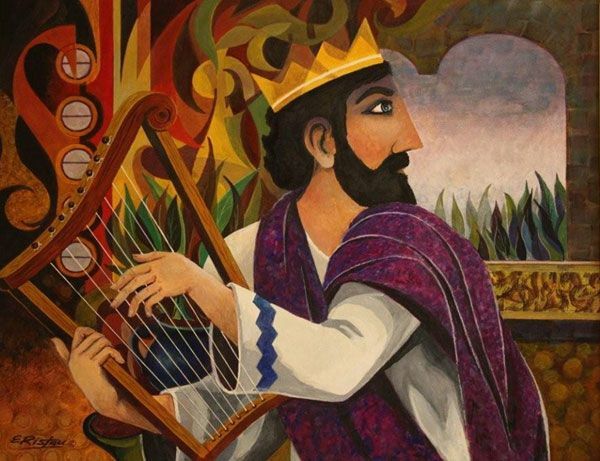 Last, since David was idealized as Israel’s great king, the connections to David point to the hope of God’s people for the renewal of God’s reign and kingdom. As followers of Jesus, we recognize these longings are fulfilled in Jesus, and these model prayers continue to help us live confidently in the knowledge that Jesus will return triumphantly to usher in fully God’s abundant future. Beginning with Ps 3, there are 13 psalms that specifically link the content of the psalm to a context within the life of King David. For example, Psalm 3 invites us as readers to ponder David’s state when we was fleeing from the rebellion led by his own son Absalom against his leadership (see 2 Samuel 15–17). This reference is meant to give a context for reading the psalm. We are to imagine ourselves in a desperate situation in which we are surrounded by foes, including potentially people whom we have trusted deeply but who are now betraying us. The reference to David does not mean that we can only pray this psalm if we are in the precise situation as David. Instead it shows how a righteous king such as David models prayer for God’s people today. The psalms with explicit links to David’s life are Pss 3, 7, 18, 34, 51, 52, 54, 56, 57, 59, 60, 63, and 142. As we pray the psalms, let us assume the posture of Israel’s greatest king and lift our prayers to David’s and our true king: the LORD. The book of Psalms or Psalter is a rich resource for God’s people. In this book, we find prayers that serve a dual focus. The Psalms serve as God’s word for us while at the same time modeling words for us to speak to God. Ponder that for a minute. God values our prayers so much one entire book of Scripture serves as fuel for our prayer life. The Christian life involves following the risen Jesus as he leads God’s people into the world to make disciples. As experience teaches, life has ups and downs. There are times of abundance and times of challenge. In all seasons, God invites the prayers of his people. Reading the Psalms is an instructional guide to a moment-by-moment walk with God through the world. The book of Psalms divides into 5 units or books: 1–41, 42–72, 73–89, 90–106, and 107–150. This structure is embedded into the final composition of the Psalter. Just as the Torah of Moses (Genesis–Deuteronomy) consisted of five books so too are the the Songs of David made up of five books. This study will focus primarily on Book I. The only exception to this will be the treatment of Psalms 146–150 in Week Two of the Study. As we will see, Psalms 1–2 serve as an introduction to the Psalter as whole by grounding the reader in two key truths. Ps 1 emphasizes the need for a constant attentiveness to Scripture (Ps 1). Ps 2 declares that we can have full confidence in the security of the future by trusting in God’s reign. The book of the Psalms reaches its climax in Pss 146–150 which conclude the Psalter with five resounding psalms of praise to the LORD for who He is and what He has done. In between this introduction and conclusion, we will journey through the prayers of God’s people. The book of Psalms contains many types of prayers. The three core prayers may be stated simply: (1) Praise the LORD! (2) Help! (3) Thank you! There are other types as well. Some psalms focus on God’s kingship—sometimes these praise God as king other times, the psalm focuses on God’s rule through his anointed human king or Messiah. Other psalms focus on the importance of God’s Word, provide wisdom for living, or serve as affirmations of the psalmist’s trust in God. Of these, readers are often surprised to learn that the most common prayer in the book of Psalms is a petition for help. Through these various types of prayers, the psalms give voice to joys, complexities, and challenges of the life of faith. This reality is what makes the book of Psalms timeless in its appeal. People of prayer can find words to express themselves to God in times when they are unsure of how to pray. John Calvin wrote, “I have been accustomed to call this book, I think not inappropriately, 'An Anatomy of all the Parts of the Soul;' for there is not an emotion of which any one can be conscious that is not here represented in a mirror.” Athanasius “…these words become like a mirror to the person singing them, so that he might perceive himself and the emotions of his soul, and thus affected, he might recite them. We represent another generation of pray-ers looking for ways to speak to God. With humility and in anticipation of finding fresh astonishment and sustenance in these God-inspired prayers, let us begin our own journey into the Psalms. What lessons have you learned about prayer from the book of Psalms? Like Ps 146, Psalms 147 is a hymn of praise to God. It begins and ends with the exhortation, “Praise the LORD.” Psalm 146 focused on God as king and his faithfulness in sustaining the righteous. Psalm 147 continues this vein and provides additional rationale for praising the LORD. Both Ps 146 and Ps 147 draw from the long history of God’s people. Ps 146 emphasized the need to trust in God rather than in human rulers. Israel’s kings and leaders failed in their leadership. The sins of God’s people led to exile, the ruin of Jerusalem, and the destruction of God’s temple. The psalmist writes from the perspective of deep loss and a longing for a new future. At first glance, Ps 147 seems to jump from topic to topic. The psalmist praises God for rebuilding Jerusalem/restoring God’s people (vv. 2–3, 5–7, and 12–14 ), for his power over and in creation (vv. 4, 8–11, 15–18), and for revealing his word and laws to God’s people (vv. 19–20). Yet when we ponder this prayer more deeply, there is a crucial message. Ps 147 envisions the renewal of God’s people. Yes, the past recorded loss and suffering, but there is a wonderful future in God. The good news of this new future is it all depends on the LORD. Israel’s past is now past. It’s future is open because God is willing, ready, and able to restore and renew the fortunes of God’s people. This is how the verses about God’s powerful ability to create fit into the psalm. God’s people can be fully confident in their future because the God, who creates, who numbers the stars, whose power is vast and unlimited, who brings rain to the land, who raises up grass and vegetation, who cares for the animals and who controls the weather simply with a word, is ready, willing, and able to act decisively to renew God’s people. How do God’s people respond to this abundant future? With gratitude and praise. Ps 147 offers a way through the chaos of the world. The way forward is praise to the God who guarantees our future. This is a crucial word especially when we are in times of want and lack in the present. The answer is a deep trust not in our own abilities or in any human leader or institution but in God. Ps 147 ends with a reminder of the key resource first mentioned in Ps 1. Unlike all of the nations, God’s people have access to the Word of God. It is our guide as we seek to live faithfully for God’s mission. How does Psalm 147 teach us to pray? What are the reasons that Psalm 147 calls us to praise the LORD? How do the references to God as creator serve to shape our praise? All this took place because the Israelites had sinned against the Lord their God, who had brought them up out of Egypt from under the power of Pharaoh king of Egypt. They worshiped other gods and followed the practices of the nations the Lord had driven out before them, as well as the practices that the kings of Israel had introduced. The Israelites secretly did things against the Lord their God that were not right. From watchtower to fortified city they built themselves high places in all their towns. They set up sacred stones and Asherah poles on every high hill and under every spreading tree. At every high place they burned incense, as the nations whom the Lord had driven out before them had done. Core truth: God sent prophets to call God’s people to realign with their vocation of serving as God’s missional community for the nations. God’s prophets are diverse in origin. Among the writing prophets, Ezekiel is a priest, Isaiah is a political insider, and Amos is a shepherd. While most are men, when we include the narratives about prophets in Joshua–Kings, we will discover that there is a female prophet named Huldah (2 Kings 22:14–20) during the days of Josiah. God’s prophets also deploy both words and physical acts to proclaim God’s will for his people. The actual words of the prophets dominate their books, but the prophets use other methods as well. Here are some examples: the book of Jonah speaks God’s Word through a narrative about Jonah’s mission to the Assyrian city Nineveh. Hosea marries an unfaithful woman for the purposes of illustrating Israel’s unfaithfulness to God and his persistent love to woo Israel back to faithfulness. Psalm 146 begins the Psalter’s final flurry of praise with the psalmist calling himself or herself to the act of praising the LORD. In verse 1, he twice repeats the exhortation “Praise the LORD!” In the second phrase, he calls upon his soul to join the praise. In other words, the psalmist invites the totality of all that he is to return praise to God: all of our gifts, talents, thoughts, and emotions. Verse 2 offers the response of the psalmist. He declares his intention to indeed praise the LORD all of his life. Notice that in verse 2, the psalmist personally identifies the LORD as “my God.” To praise God is to proclaim one’s loyalty and relationship to the LORD. Ps 146 then turns to the main body of the Psalm in verses 3–10. The focus is on trust. We praise the LORD because the LORD alone can be trusted to sustain and carry us through the journey of life. Verses 3–4 set up a contrast between trusting human authorities versus trusting the LORD. There is a problem with human leaders. No matter how great they may be, their power is temporary and there is no ultimate deliverance or salvation in them. One of the key questions in life is this: Whom do you trust with your life and loved ones? Psalm 146 knows that there is only one being worthy of this trust: the LORD. Verses 5–10 tells us why this is true. First, verse 5 boldly declares the happiness or state of blessedness of each person who finds help and hope in the LORD. We saw the word translated “blessed” in Ps 1:1 and 2:12. Now we encounter it here at the end of the Psalms. This is good news. Our journey through life has a happy ending. Second, verses 6–10 give the specific reasons that demonstrate why trusting and hoping in the LORD is superior to trusting in human power. These verses celebrate God’s actions and character. We can trust God because he is the Creator of all that exists (v.6). The creator and savior of the world are one and the same. We can trust God because of his eternal faithfulness. God is absolutely dependable to do the right thing at the right time every time. God has the track record to prove this. Verses 7-10 list tangible evidences of God’s faithfulness. The Creator does not sleep on the job but continues to act for justice and wholeness for all including in particular those desperate for what only God can do. This includes the oppressed, the hungry, the prisoner, the blind, the humbled, the foreigner, the fatherless, and the widow. In other words, God is radically for the marginalized. In fact, these states of need do not suggest that such persons deserved their condition, but rather Psalmist declares that “God loves the righteous.” The implication is that these very persons whom the powerful often overlook are part of God’s people regardless of circumstances. The Gospel is not simply good news for the powerful and connected; it is good news for everyone including the disenfranchised and disconnected. Third, verse 9b announces that the LORD who sustains the righteous confounds the wicked. Their will be people who choose to thwart God’s mission and oppress God’s people, but their day will come to an end. Last, Psalm 146 reminds us that the LORD reigns forever. Therefore, God’s people must praise and worship him. What reasons does the psalmist give us for praising God? Whom do you trust with your life and loved ones? "Missional hermeneutics” is a way of interpreting Scripture that starts from the assumption that the NT communities were all founded in order to continue the apostolic witness that brought them into being. Every NT congregation understood itself under the mandate of our Lord at his ascension: “You shall be my witnesses.” The work of apostolic witness was not only to proclaim the gospel of salvation and to establish congregations of believers. Their work was not done when there was a community of Christians now growing in their faith and moving towards its promised outcome, “the salvation of your souls” (1 Pet 1:9). Their mandate was to found congregations where their shared experience of God’s saving love equipped them to become witnesses. They were empowered by the Holy Spirit to spread the word and the evidence of the gospel of new life and hope, and they did it! To that end, the NT documents were all, in some way, written to continue the process of formation for that kind of witness. They intended the continuing conversion of these communities to their calling—and that is how the Spirit used (and still uses!) these written testimonies. While this quotation resonates with me in many ways, I wish that Gruder would have included more on the contribution of the entire Bible for the articulation of a missional hermeneutics. I think that we can apply Gruder’s thoughts to the totality of Scripture. The Bible is the story of God’s mission. God created humanity to serve as a missional community that reflected his character to and for all Creation (Genesis 1:26-31). The infestation of sin into every human individual and institution (Genesis 3-11) changed the scope of God’s mission. The Bible tells the story of God’s work to reclaim and renew Creation from the results of sin. Humanity, however, continues to serve a key role. God calls Abraham to begin the renewal of humanity (12:1-3). The story of Abraham culminates more than a millennium later in the life, death, and resurrection of Jesus. 3) Describes the dignity and vocation of humanity: to serve as a missional community to reflect God’s character to and for Creation. 4) After the entrance of sin, God works to establish a new humanity—Israel to serve as a missional community to reflect God’s character to and for the nations. In other words, mission takes a anthrocentric turn. Creation is still within the scope of mission, but the burning issue becomes the restoration of humanity. 5) The Old Testament points to the fulfillment of God’s mission through Messiah including death and resurrection. 7) Provides resources to engaging the surrounding cultures without succumbing to syncretism. If you are interested in a small group resource that introduces the entire Bible with a missional perspective, check out my recent book Invitation. In Psalm 23:1, the psalmist prays memorably, "The LORD is my shepherd. I lack nothing!". Read my blog on this verse. Psalm 23 continues with reflection on the meaning of the LORD serving as the good shepherd of our lives. Verses 2–6 offer specific ways in which the LORD serves as the shepherd that each of us longs to address as my shepherd. Verses 2-3 build immediately on the declaration of Ps 23:1 with beautiful imagery of tranquility and peace. All is well in the life of the sheep. The good shepherd provides all that the flock requires and actively guides each sheep down the paths of righteousness. These verses ground pray-er in abundance before reflecting on the challenges of life. In verse 4, the tone and the perspective of the psalm changes. Just in case we have been misreading the good news of Ps 23, it gets better. The good shepherd is no fair weather friend. The LORD is the kind of shepherd who is all in for his flock even in the toughest times in life. Darkest valley is traditionally translated “shadow of death.” In other words, the LORD is present and guiding each member of his flock in all circumstances including even those that put us in the danger of death itself. Verse 4 helps us to understand the right paths of verse 3 more clearly. The pathways of life will likely include both times of joy and times of sorrowful trouble. Yet, God remains steadfast in faithfully guiding us through. The psalmist is so overwhelmed by the realization of God’s presence even in the darkest valley that the prayer shifts from 3rd person “him” language about God to 2nd person “you” language to God. This is prayer at its best. Ps 23 shifts from a song of trust about God to a prayer of faith to God. God is no mere object in the psalmist’s life. God is subject and in relationship with the psalmist. What does this mean? It means that we practice our faith by talking with God rather than merely talking or thinking about God. God is with the psalmist and brings comfort to him at the point of deepest need. The shepherd uses his rod and staff not as a weapon to punish the psalmist but to guide and comfort. Verses 5–6 shifts the prayer to its climactic end. The imagery is of a victory feast. The fields, pathways, and valleys have morphed into a well set table. Abundance has triumphed. All of the threats and enemies stand defeated. God prepares and offers a bountiful buffet for the psalmist with former enemies and the dark moments of life now in the background watching. The message is clear. Trusting God leads to security and abundance. Hardship and darkness will not have the final say. In fact, the pray-er ends with a powerful affirmation of God’s goodness and love in the full confidence that he or she will abide in God’s presence forever (v. 6). How would you live your life differently if you truly believed that an abundant and good future awaited you? Following the passionate lament and thanksgiving of Ps 22, Psalm 23 serves as a declaration of deep trust in the LORD. Psalm 23 is written from a first-person individual perspective. It serves as a prayer or meditation on one’s own faith in the LORD’s provision. Is there any better response to the reality of God’s presence in any circumstance than reflecting on the depths of our own trust in God’s faithfulness? Verse 1 begins memorably with psalmist reflecting on his/her relationship with God. The psalmist choose the words carefully and they are ripe with meaning. The LORD is my shepherd. The psalmist knows his/her God personally and relationally. The Psalmist prays my shepherd and not our shepherd, his shepherd, her shepherd, your shepherd, or their shepherd. Don’t rush past this observation. Trust manifests in the individual. Ps 23 invites us to pray and proclaim our own individual faith in the LORD. Martin Luther once wrote, “Everyone must do his own believing just as everyone must do his own dying.” What does this mean if you are struggling in your faith? Again the Psalter provides words for us to offer to God in times of bounty and scarcity, on days of unshakeable faith and on days when we are closer to the words of the father out of whose son Jesus had cast a demon, “I believe LORD help me with my unbelief.” The faith expressed in Ps 23 can even inspire us in times when we find ourselves barely able to pray at all and teetering on unbelief. The power of Ps 23 is its ability to sustain us even in the darkest times. What flows from an intimate trust in the care of the LORD as my shepherd? It is the realization of my own lack of need. If God is truly my shepherd, I am in need of nothing. The same God who invites us “Give us this day our daily bread” can be trusted with all aspects and areas of my life: financial, relational, physical, and spiritual. Praying “I lack nothing” also puts me in a position of generosity. As my needs are met, I can look outward to the needs of those around me as well. What does it mean for you to pray “The LORD is my shepherd”? 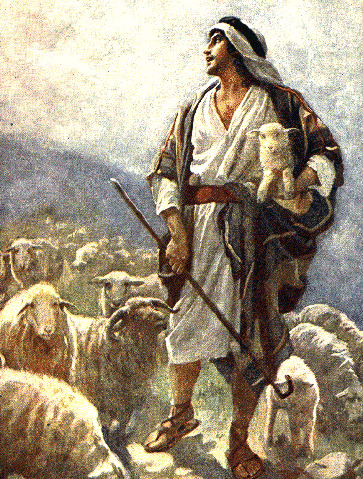 What does the imagery of “shepherd” tell us about God?